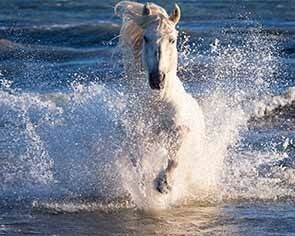 So many people across the globe fulfil their life-long dream with us to photograph the Wild White Horses of the Camargue. You can’t beat the adrenalin rush of this noble breed splashing through the shallow waters of the marsh and lakes. Action shots, sparring stallions, and gorgeous portraits, under Mediterranean blue skies, make for award-winning photography. Exclusive shoots, in small groups, led by No.1 Camargue specialist, Serge Krouglikoff, whose international photography career spans over 30 years. This workshop appeals to Wildlife and Equine photographers alike. This itinerary is a draft only and is subject to change. At 18h00, we will gather for a welcome drink and briefing meeting. We leave before dawn for the Parc Ornithologique, which is a natural Camargue wetlands area with a large array of birdlife, including the famous Pink Flamingos. Create Away’s privileged Camargue contacts provide us with access the park before sunrise and before it opens to the public, so you can capture wonderful, exclusive images as the birds fly in to begin their day. In the afternoon, we photograph at least a dozen Wild White horses running through the marsh and heading straight towards your cameras. We shoot several drives with the horses running across your field of view! We will also take shots of the ‘Gardians’ (Camargue Cowboys) dressed in their traditional Camargue shirts & hats, trident in hand, surrounded by the herd as well as some close up portraits of these ‘weathered’ ranchers. In the morning we have another session with the horses running together through the shallow waters of the lakes. After the action, we then take portraits of the horses on their own or in small groups. In the afternoon we photograph the white horses running through the marsh, in a different location. We will also capture the ‘Gardians’ at work herding the wild horses.